Nikolai Nikolaevich Yudenich (Russian: Николай Николаевич Юденич) (July 18 ,1862 (July 30, New Style ) - October 5, 1933), was a commander of the Russian Caucasus Army and one of the most successful generals of the Russian Imperial Army during World War I. He was later a leader of the anti-communist counter-revolutionary White movement in Northwestern Russia during the Russian Civil War of 1918-1920. Yudenich was born in Moscow, where his father was a minor Court official. Yudenich graduated from the Alexandrovsky Military College in 1881 and the General Staff Academy in 1887. He first served with the Life Guards Regiment in Lithuania from November 1889 to December 1890. In January 1892, he was transferred to the Turkestan Military District, and was promoted to lieutenant colonal in April 1892. He was a member of the Pamir Expedition in 1894, and was promoted to colonel in 1896. From September 20, 1900 Yudenich served on the staff of the 1st Turkestan Rifle Brigade. In 1902, Yudenich was appointed commander of the 18th Infantry Regiment, which he continued to command during the Russo-Japanese War of 1904-1905. He was wounded in the arm during the Battle of Sandepu, and wounded in the neck during the Battle of Mukden. At the end of the war, he was promoted to major general. Subsequently, from February 1907, Yudenich served as Quartermaster of the General Staff of the Caucasus Military District. He was promoted to lieutant general in 1912, and served as Chief of staff) at Kazan, followed by the Caucasus Military District in 1913. In the beginning of the World War I Yudenich was appointed Chief of Staff of the Russian Caucasus Army. He won the Battle of Sarikamis against Enver Pasha of the Ottoman Empire. In January 1915, Yudenich was promoted to General of Infantry, and replaced Count Illarion Ivanovich Vorontsov-Dashkov as commander of the Caucasus Campaign. Yudenich tried to exploit the Turkish defeat by attacking into Turkish territory, specifically around Lake Van during Van Resistance. While the Russians did capture Van in May 1915, they were forced to withdraw from the city two months later. The Ottoman 3 Army re-occupied Van in August. At this time, Grand Duke Nicholas, having been removed from command of all of Russia's armies, was put in charge of the Caucasus region. Yudenich was given a free hand by the Grand Duke and, in September, the Russians retook Van and re-established the Administration for Western Armenia in June 1916. Fighting back and forth around this region continued for the next 14 months without a clear victory for either side. In 1916 Yudenich successfully carried out an offensive, winning the Battle of Erzurum (1916) and the Trebizond Campaign. In the summer of that year, his forces fought off a Turkish counter-attack culminating in the Battle of Erzincan (despite the presence of Turkish General Mustapha Kemal). During this battle, Yudenich was awarded the Order of St. George (2nd degree), the final time this decoraton was awarded in the Russian Empire. The success of the Russian army (limited though it was) in Eastern Anatolia had some influence over the course of the Armenian Genocide. Following the February Revolution, in 1917 Yudenich was appointed commander of the Caucasus Front, but in May the Russian Provisional Government removed him from command for insubordination, and on the direct orders from Alexander Kerensky, he retired from the army. Yudenich then relocated from Tbilisi to Petrograd, where he supported the Kornilov Revolt. Following the October Revolution, Yudenich went into hiding from the Bolsheviks, sheltered by a former sergeant of the Life Guards of Lithuania, who had served with Yudenich from his time in the Pamirs. He managed to escape to exile in Finland in January 1919. At Helsinki, Yudenich joined the "The Russian Committee", which had been established in November 1918 to oppose the Bolsheviks, and was proclaimed leader of the White movement in northwest Russia with dictatorial powers. In the spring of 1919 Yudenich visited Stockholm, where he met with diplomatic representatives of Great Britain, France and the United States, trying with limited success to obtain assistance in developing a Russian volunteer corps to fight the Bolsheviks. In June 1919, Yudenich made contact with Admiral Aleksandr Kolchak's All-Russian Government based in Omsk, and was subsequently acknowledged as commander-in-chief of all Russian armed forces, operating against the Bolsheviks in the Baltic Sea and in northwest Russia. Kolchak also provided much-needed funds to pay and equip his forces. 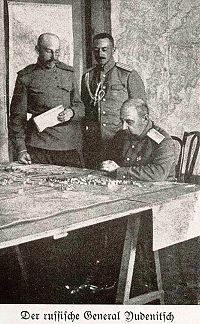 In June 1919, Yudenich went to Riga to meet with General Aleksandr Rodzyanko, commander of the commander of the Northwestern White Army, whom he appointed as his aide. In August 1919, under pressure from the British government, Yudenich created the counterrevolutionary "Northwestern Government", which included Monarchists, Socialist-Revolutionaries and Mensheviks, and which confirmed the sovereignty of Estonia. Yudenich agreed to serve as Minister of War for the new government. and spent the next three months organizing and training his army. By September 1919 Yudenich had a fairly well-organized army of approximately 17,000 troops, with 53 guns and six tanks. In early October, 1919, Yudenich launched his army against Petrograd, which was only lightly defended as the Red Army was actively engaged on several other fronts, fighting |Kolchak's forces in Siberia and several Cossack armies in the Ukraine. Yudenich's friend from the Imperial Russian Army, General Mannerheim, asked the president of Finland, Stx�hlberg, to join Yudenich's force and attack Petrograd with the help from the White Finns. Yudenich would recognize Finland's independence and Finland's pro-Triple Entente relationships would be recognized. As Kolchak (who was nominally the leader of the White Armies) would not recognize Finland's independence, Stx�lhberg denied Mannerheim's request and Yudenich attacked Petrograd alone. On October 12, Yamburg was retaken by the Whites. Two days later Yudenich was approaching Gatchina. On October 19, 1919 his troops reached the outskirts of Petrograd; however, he failed to secure the Moscow - Saint Petersburg Railway, which allowed the Revolutionary Military Council to send in massive reinforcements to prevent the fall of the city to White forces. Politically, the Bolsheviks secured the defection of Yudenich's Estonian allies by promising to recognize Estonian independence and territorial claims, and this by November 1, 1919 Yudenich was forced to retreat. Finding that Estonia had proclaimed its neutrality, Yudenich was trapped with no escape route, and thus was forced to agree to the dissolution of the North-Western Army. Yedenich was arrested by Estonian authorities with the assistance of his former aide, General Stanisław Bułak-Bałachowicz, and the remaining funds of the Northwestern Government were paid to its surviving troops. Yudenich was soon freed by diplomatic pressure from Great Britain and France, and departed for exile in France. During his remaining 13 years, he played no significant role among White movement �migr�s. Yudenich died at Saint-Laurent-du-Var, near Nice on the French Riviera, on October 5, 1933.